We’d love your help. Let us know what’s wrong with this preview of Rise of the Dragons by Angie Sage. Mega bestselling author Angie Sage takes flight with an epic adventure that imagines dragons in the modern world. Includes 9 collectible game cards that unlock an online game! The first in a thrilling multi-author series. Once our world was full of dragons who lived in harmony with humans. 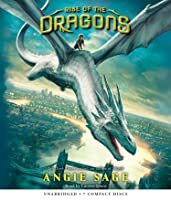 But aft Mega bestselling author Angie Sage takes flight with an epic adventure that imagines dragons in the modern world. Includes 9 collectible game cards that unlock an online game! The first in a thrilling multi-author series. To ask other readers questions about Rise of the Dragons, please sign up. Dear Angie, Is this book connected with the Septimus Heap and Todhunter Moon Series? Yahli I just finished the book and it has nothing to do with the Septimus Heap series, it's an entirely separate series. I am sad to say that this was not one of my favorite new middle grade books. It was something I had high hopes for and it just fell short. I will say this: the world is pretty cool. It's a fun new adventure with dragons and inter-dimensional travel. However, the way this book was executed was sloppy, confusing and hard to follow. There were two stories 1) a young girl from our world who is slowly losing her mother to an unknown illness and 2) kids from another world, with dragons and magic. It was I am sad to say that this was not one of my favorite new middle grade books. It was something I had high hopes for and it just fell short. There were two stories 1) a young girl from our world who is slowly losing her mother to an unknown illness and 2) kids from another world, with dragons and magic. It was billed as a book where the dragons are coming back to our world but spoilers: they literally don't come back to our world until the last chapter. The whole plotline you thought you were reading (as described by the back of the book) is a lie and doesn't happened until the end. And I mean the very, very, very end. So it was as if this whole book was a precursor for the real series. Needless to say, that was wildly disappointing. Additionally, these characters were terrible. I understand that they are literal children however they were dumb and wishy-washy and not at all likeable. I found them irritating and not heroes I would want children emulating or looking up to. Nor would I think they were characters worthy of critique and examination, something to teach from which to teach kids. Nope, just annoying. This is not a book I would recommend to middle readers. There are other cool dragon books out there like WINGS OF FIRE. I was hoping this would be something more but unfortunately, it fell short. 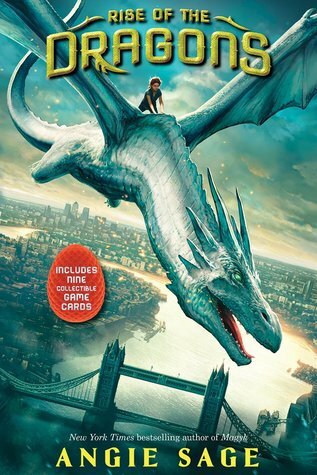 I adored The Magyk series by Angie Sage and it remains a perennial favourite with our library’s young readers, and so I jumped at the chance to read and review the first book in her newest fantasy series, Rise of the Dragons. With the promise of game cards and a matching online game, Rise of the Dragons promised to be an exciting release. The new world Sage has created and her daring plot of intrigue, dragon battles and family bonds is both thrilling and thoroughly enjoyable. It is sure to be a I adored The Magyk series by Angie Sage and it remains a perennial favourite with our library’s young readers, and so I jumped at the chance to read and review the first book in her newest fantasy series, Rise of the Dragons. With the promise of game cards and a matching online game, Rise of the Dragons promised to be an exciting release. The new world Sage has created and her daring plot of intrigue, dragon battles and family bonds is both thrilling and thoroughly enjoyable. It is sure to be a hit with our middle-grade readers. After all, everything is better with dragons. Once upon a time dragons roamed the earth. Now dragons are just a myth, but Sirin, raised on the tales of old, knows the truth. In another world, Joss and Allie’s life was destroyed by the Raptors - fearsome dragons and their riders who seek to control and destroy everything in their path. When Joss discovers a silver dragon egg and Locks with the dragon that hatches, he and his sister are thrown into a world where they will have to fight for freedom and to prevent the Raptors taking control of them, their dragon and the power to cross over to the other world. Firstly, the synopsis provided for Rise of the Dragons seems to be a more overarching indication of the plot of this series, rather than the plot of this particular book. The events hinted at in the publisher provided synopsis, focused on Sirin and her journey Locking with a dragon, form a very small part of Rise of the Dragon. While Sirin’s story and voice are captured in a few chapters, the majority of the chapters are shared between Joss, Allie, dragons and members of the Lennix family, who rule the Raptors. The entirety of the book is written in third person, so this frequent switching of character focus is easy to follow along with. The dragons in Rise of the Dragons are very cool. While they do not differ too much from the standard winged, flame-breathing creatures of many a fantasy novel, the ability to Lock with humans and communicate via both Dragonsong and mentally with their Lock is interesting. They are truly fearsome beasts and Rise of the Dragons culminates in a deadly and brutal battle. There are frequent references to death (by eating, fire, and injury), both human and dragon, which may frighten some younger readers. Joss and Allie, along with Sirin in the periphery, make for strong and likeable protagonists. While Joss makes some big mistakes, he is quick to correct them, while his sister and Sirin offer two very strong and wise portrayals of young girls. With plenty of adventure and intrigue, it is easy to be captivated by the fast-moving plot of Rise of the Dragons. This promises to be an exciting series and I look forward to reading the continuing adventures of these three young people and their dragons. You can play the online version of the card game at scholastic.com https://www.scholastic.com/kids/book/... It took me a few tries to figure out the structure of the game, but unfortunately I never progressed past level one. Even with many attempts, multiple strategies and an increasing level of determination to best it, I never won. I am very interested in seeing how the cards can be used to play in real life. Oops, about the book. Good vs evil, the oppressed vs the entitled, family lost and found, and of course, some man eating dragons. The characters are lovable yet fallible, the plot line moves quickly, and even though there is traumatic death, it is not dwelled upon. Would I read the rest of this series? Yes. Will I recommend it to tweens, as well as the fantasy obsessed gen-Xers? Yes. Will I remember all this when the next book comes out? I don't know. Is there a time line of publishing? Will there be media hype and ARCs? For most people, including myself, the wait till the next book in a series, is a long and torturous one, that leads to forgetfulness. This is a decent book. It has interesting characters, especially including the dragons, and the world is pretty well drawn. I liked it more than I initially thought I would, and followed along better than I initially suspected I would. However, it is not at all of the calibre of the Septimus Heap books. Perhaps that is because so very much has already been written about dragons in fantasy books. I was able to follow the abrupt character transitions that some have complained about, because the au This is a decent book. It has interesting characters, especially including the dragons, and the world is pretty well drawn. I liked it more than I initially thought I would, and followed along better than I initially suspected I would. However, it is not at all of the calibre of the Septimus Heap books. Perhaps that is because so very much has already been written about dragons in fantasy books. I was able to follow the abrupt character transitions that some have complained about, because the author was careful to identify the new speaker/thinker right away. I probably will try the sequel, and if I like it more, will re-read this first one. It was a great book full of action + adventure ! I fell in love with this author thru the Septimus Heap series. I have to say that this new series did not disappoint. Dragons are just myths and legends, but we know the true. When Joss finds a dragon egg, he gets a big surprise when the dragon bounds with him. Read the book to start in this adventure with Joss, Allie, and Sirin. Loved the c I voluntarily offered to review this book with no obligations and my opinions are honest! Loved the characters + the storytelling! This book was a Best of the Best for the month of April, 2019, as selected by Stevo's Book Reviews on the Internet. http://forums.delphiforums.com/stevo1.... Search for me on Google for many more reviews and recommendations. A wonderful homage to Anne McCaffrey and the Dragons of Pern. A great choice for readers who love Wings of Fire or How To Train A Dragon. I can't wait for more! Dragons, orphans, cruel overlords, and a Lost World--what's not to like? Kids will love this series starter. Great new middle grade series by the author of the Septimus Heap books. Very exciting, and will have collectible game cards.